Looked and looked at a lot of boats that were too far gone for me, and never found a red one with the Sun 'n Fun seats. Finally found one last week for sale and bought it yesterday and brought it home. 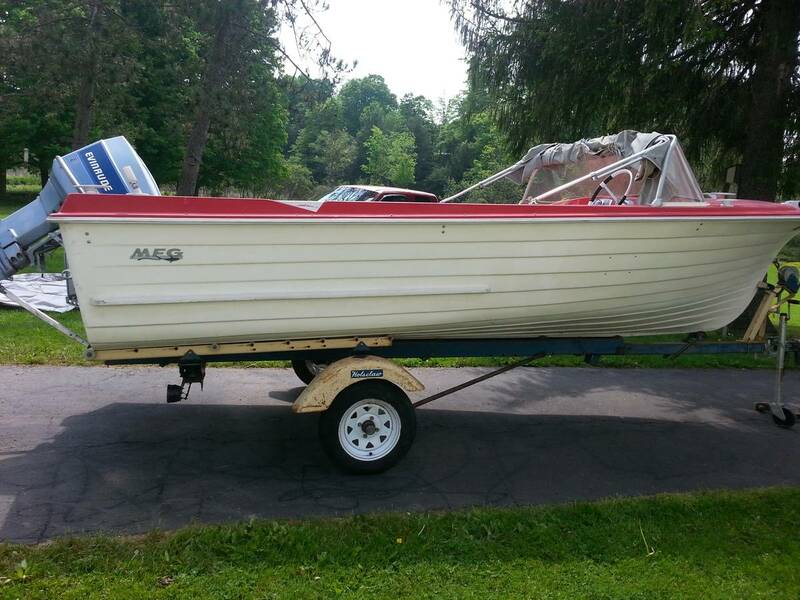 It needs a new transom, the red deck is oxidized pretty badly, particularly in the bow portion, but it's all there. The white plastic coated hardware needs refinishing - its pretty worn and cracked with the coating missing in a number of places on the parts. Good news, it has the original die cast MFG emblems on both sides of the boat, and they are not in too bad of shape - only a few pits. But, as usual for these, its very solid, except for the transom. (I'm realizing how lucky I was to find my Niagara with the original transom instact.) I plan to tackle that first, then restore the rest. The motor is a 1984 Evinrude 70hp model, but I eventually plan to try to find a 1962 Evinrude 75hp Starflite with manual shift. 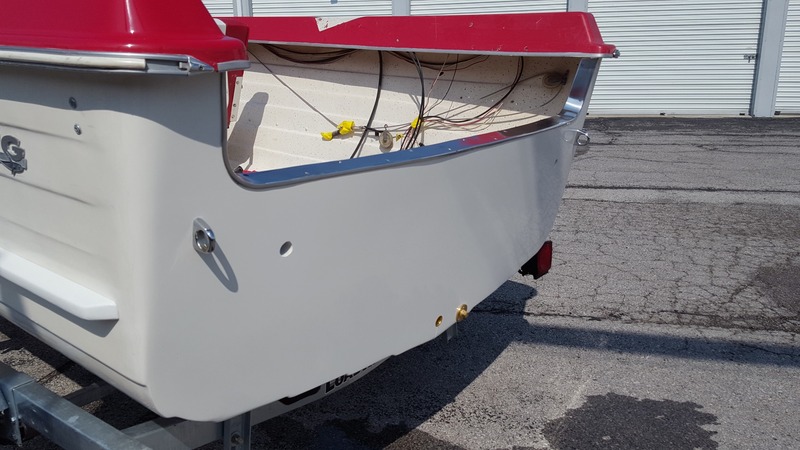 Those were charcoal in color that year, with red, white, and chrome trim that will go real well with the boat, and of course would be the same year. 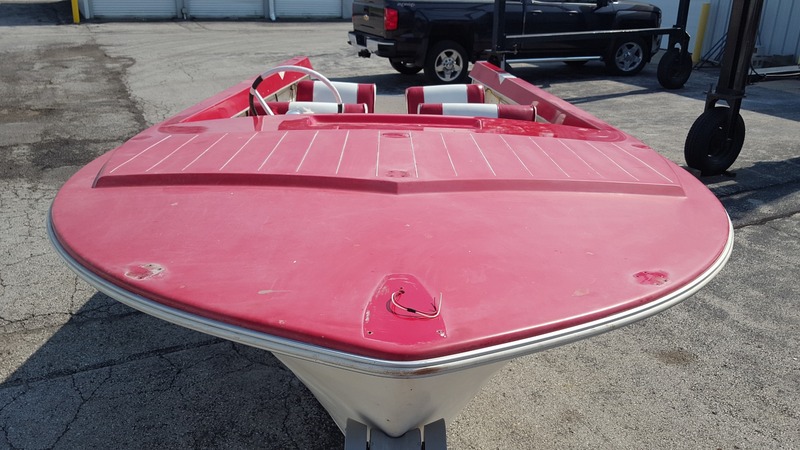 The boat has been in the same family it's whole life and was originally equipped with a 1962 Evinrude 40hp Lark that was replaced with the current motor in 1984. In the meantime, I still have the Niagara and am in the process of selling my little Arrow Glass Flyer. My limit is two boats, and I really don't have room for three. If anyone has a red one from 1962-1963 with the Sun 'n Fun seats, I'd love to hear from you. 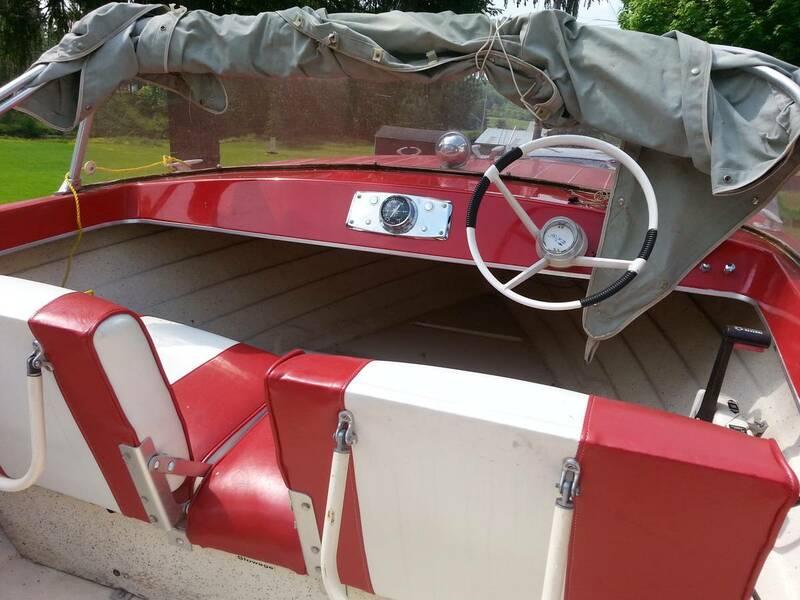 My dad's first boat, purchased new, was a red 1963 Westfield, with the charcoal and white Sun 'n Fun seats and a new but leftover 1962 Evinrude Lark outboard, with the charcoal, red, white and chrome color scheme. It was the inspiration for trying to find a similar Edinboro. Congratulations on the find! It looks great! Those seats are nice, its too bad there are not replicas out there. Thanks. It's a bit of a project, more so since I've discovered some cracks along the keel. I think I'm going to get it weighed to determine if the foam is soaked before diving in on repairs, along with moisture meter checks. I got spoiled with the Niagara - this is a more normal 50+year-old boat, but at least it has the original Sun 'n Fun seats. This is my biggest project yet. So it has been awhile, but my Edinboro is slowly coming together. I decided to have most of the work done at a local restoration shop and the work had been of the highest quality. The transom has been completely rebuilt, using Cabon-Core CarbonBond, the fiberglass skins repaired, the inner skin of the transom repainted with duplicated splatter paint, the outer skin re-gel coated, the keel cracks and small holes repaired and re-gel coated, the motor well completely rebuilt and re-gel coated, and the seat boxes rebuilt and repainted. The deck was sanded four times with increasingly finer sand paper and polished. (The MFG gel coats from back then were so thick, that sanding and polishing brings it back without having to repaint or re-gel coat it.) The deck hardware has been stripped, powder-coated, and new tape strips applied, along with the 16 deck pin stripes redone. The windshield had a big bend in the middle from the previous owner falling on it while trying to tie a line to a cleat. That's been repaired and the windshield will be polished the reinstalled with a new gasket along the bottom. One picture shows how faded and oxidized the deck was before restoration. It's all coming together for a spring relaunch from the new Load Rite trailer. 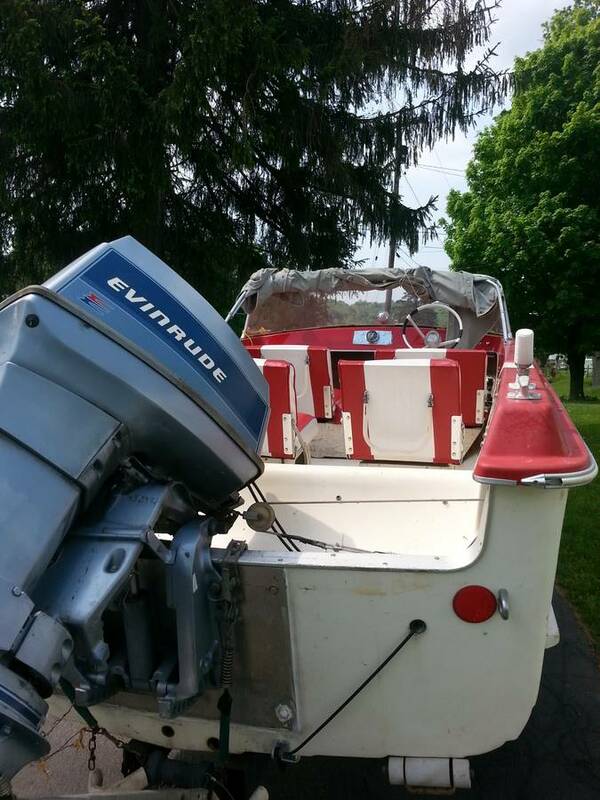 The 1984 Evinrude 70 has rebuilt carbs, new fuel lines, new impeller, and repaired prop. The seats will have the original vinyl and new mounting hardware in most cases, on the rebuilt boxes. Turns out that TACO Marine no longer carries the white rub rail insert for 1961-1963 MFGs. Their supplier in Maine no longer makes it. He has the tooling, but there is no demand. Cost to run a batch would be too much, as he requires a run of several thousand feet. Starcraft also used white in the early 60's. Black may not be original, I think it looks better! adds a break before the white hull, just another opinion, I think your boat is beautiful. Thank you for the kind words. I'm beginning to like it better. My 1966 Niagara, of course, has this, as it came that way from the factory. So they are both black now. The black trim on the steering wheel helps to show it better, I think. 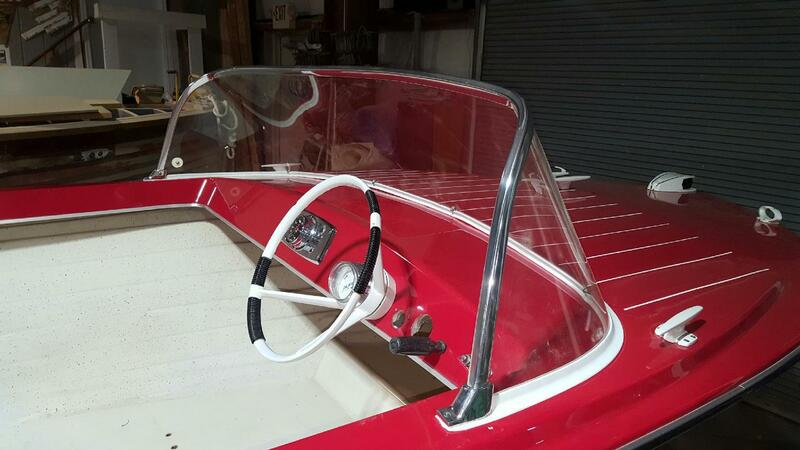 My dad's first boat was a 1963 red Westfield, and it had the white rub rail, so that's what I had in my head as a memory. In any case, it's coming together, with the goal to have it ready to show at the Piston Power Show at the IX-Center in Cleveland, March 16-18, 2018. I expect to launch it in the spring. Looking great. Show goers will appreciate seeing your Glassic. Best of luck getting ready for the show. This post helped me as I was considering white, but now think I will stay with black on my 58 Wilson. It does seem to set the colors apart. I will try to use that Armor All tire foam to see if I can riches up my original rub rail as it is a bit hazed from sun, but not at all cracked and still flexible. Mine had shrunk and was as hard as a rock, so replacement was in order. Much better now. The repaired (bent frame) and polished windshield got remounted this morning, with a new bottom gasket. For the TaylorMade Plexiglas windshield, we got it from A&A Marine. These were used by MFG, Starcraft, and many others. Comes in 110" length. for $59.95. Thank you for the link. I have never replaced one before. When the new trim is put in place with hidden fasteners. Does there need to be any sealant or rubber type glue used to grip the bottom of the windshield, or is it strictly gripped by friction? Just curious what keeps it from popping out in case I decide to push the boat a bit faster than original recreational design. Just held in by the frame itself, plus the slot for the Plexiglas that is molded into the gasket. No sealer is used. Once it sits out in the sun for a while after installation, the vinyl gasket kind of molds itself to the deck surface. 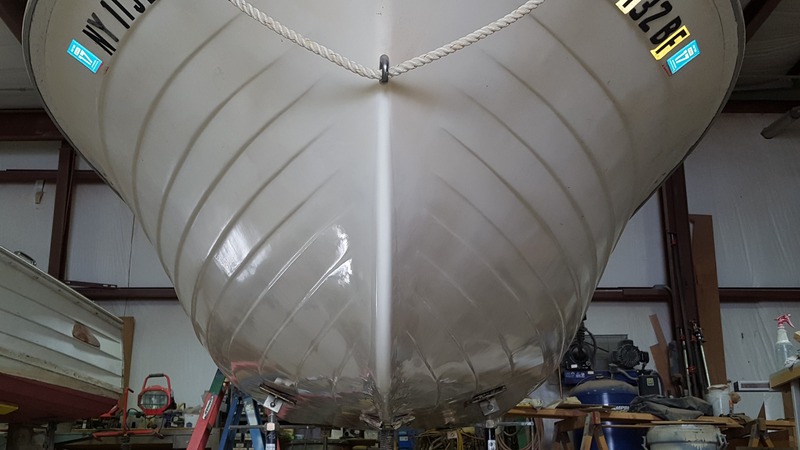 In my picture, you can see that some of a edges area bit upturned inside the cockpit side, but the shop the boat is in is only about 60 degrees on cold days like today in winter. Once in the sun for a time, it will be fine. I let my windshield with new gasket just sit in place without tightening for a week and it all flattened out. Thanks. And I just ordered some supplies from them. I need to make a bigger list and take some time so I donât miss out on my next order. Good tip on the second source for $20 less. Thanks! Following up with weighing the boat to see how much water might be under the floor, it weighed 865 pounds after taking out the trailer wight, and without the motor mounted. Subtracting 40 pounds for the weight the new CarbonBond transom added, it came out to 825 pounds. Subtracting out 10 pounds for the motor control and about 20 pounds of gear still stored under the seats, that left 795 pounds. The weight was shown as 720 pounds for years, but near as I can tell, that was low, and was only for boat with only a front seat, and I had the front and rear Sun 'n Fun seats. I estimated the true weight with all seats was around 760-780 pounds. Weight in 1970 was shown as 934 pounds, but that included an internal gas tank, a heavier windshield, plus ski racks and storage bins. So, thinking around 775 is about right, I decided 795 was not enough to really worry about, as it might really have weighed close to that anyway. So for now, I decided to leave the floor alone. We'll see how it performs in the spring. Sounds like you have done your homework. If it had a good life, maybe things are good under the floor. Mine was simple math... drained 11 - 5 gallon pales of water that was all hidden under floor of 16 footer since the drain was frozen. Several days of thawing in a garage heated above freezing and started to drain. Crazy how much water was under there. I am certain the floor should get pulled to inspect stringers for likely replacement. And foam removal if it has any... likely another few pounds there as well. Likely nearing 500 pounds of unwelcomed added stow away weight. And the things to do list grows. On mine, no water came out when the drain was opened. Foam flotation can hold water without any being released. A moisture meter shows moisture, hence the weighing. I think I'm OK. I went through all the trouble to weigh because the previous owner, for some unknown reason, had drilled a hole in the little sump in the floor at the transom, and I was concerned water had gotten in there. I missed that when inspecting the boat for purchase. And you are right - the to do list only grows as you find stuff.